The fuel injector nozzles also called as fuel injector valve, are components in automobiles which interact with pistons in the combustion chambers. This nozzle draws fuel at low pressure and ejects the fuel into the engine cylinders at high pressure. A fuel injection system requires a regulated device which aids to accurately deliver precise amount of fuel to each cylinder at required instant for combustion. In high performance automobiles and industrial diesel engines, this is accomplished by combining an electrically operated sequence valve with a regulated orifice to match precise flow with timed injection. Virtually all fuel injected engines utilize a continuous-flow fuel injection system. The overall injector nozzle market can be segmented by fuel type, nozzle type, vehicle type, by technology and by injector type. Among vehicle type, passenger cars hold the highest market share in the injector nozzle market. The reason behind this is due to increase in employment opportunities and per capita income due to industrialization, globalization, and urbanization. By fuel type, gasoline and diesel fuels are the major types of fuels used of which, gasoline is more prominently used in passenger cars and LCVs whereas Diesel fuel is used prominently by HCVs. 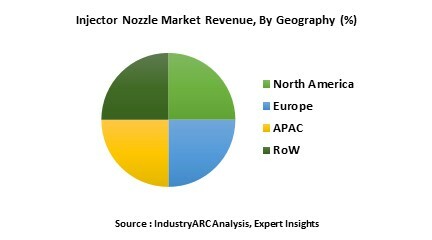 APAC region is leading manufacturer of injector nozzle market owing to the growth of manufacturing sector. Lower production costs in Asia pacific countries when compared to western regions also have spurred the growth in this region. Apart from that easy availability of economic labor and lenient emission and safety regulations also contribute to the growth of injector nozzle market. 17.10. TAIAN SUNWE TESTING EQUIPMENT CO., LTD.
17.17. NICO Precision Co., Inc.
17.20. RICAMBI MOTORI DIESEL S.R.L.